Why are our buildings crushing our quality of life? 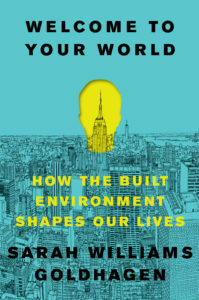 Sarah Williams Goldhagen joins the show to talk about her new book, Welcome to Your World (Harper), and how we can live in a better built environment. We get into cognitive neuroscience and the theory of mind-body-environment consciousness, the perils of lowest-common-denominator construction and design, the perils of the “starchitect” phenomenon, the limits of Jane Jacobs’ urban proscriptions, the experience of going on urban planning vacations as a kid with her dad, how she and her family wound up living in a converted church in East Harlem, the challenges of architecture criticism, how her book was predicted by one of my favorite 1980s comics, the planning process a year-long around-the-world trip, and more! Give it a listen! And go buy Welcome to Your World ! Credits: This episode’s music is Nothing’s Gonna Bring Me Down by David Baerwald, used with permission from the artist. The conversation was recorded at Sarah’s home on a pair of Blue enCORE 200 Microphones feeding into a Zoom H5 digital recorder. I recorded the intro and outro on a Heil PR-40 Dynamic Studio Recording Microphone feeding into a Cloudlifter CL-1 and a Mackie Onyx Blackjack 2×2 USB Recording Interface . All processing and editing done in Adobe Audition CC . Photo of Sarah by me. It’s on my instagram.